28628 members and growing – the largest networking group in the maritime industry! 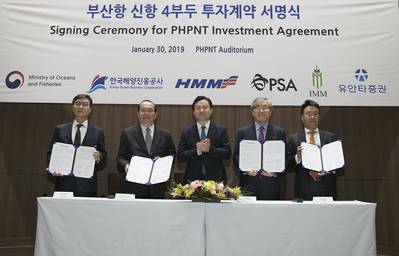 South Korean carrier Hyundai Merchant Marine (HMM) announced that it has acquired joint ownership of PSA Hyundai Pusan New-port Terminal (PHPNT) in Busan. Yuanta HPNT, a company jointly established by the shipping liner and Singaporean shipping company PSA, signed a contract to purchase Waska, which holds a 50-percent stake in the terminal at a a ceremony attended by Young-Choon Kim (Minister of Oceans and Fisheries). With the acquisition, HMM regains operational control over the terminal. "This sales contract includes that the private equity fund, Yuanta-HPNT will acquire stakes of Waska Inc. which holds 50% stakes of PHPNT," said a press release. The total investment amount will be KRW 221.2 billion which consists of HMM and PSA’s investment of KRW 177 billion (including Korea Ocean Business Corporation’s investment of KRW 50 billion) and 44.2 billion, respectively. As result, HMM becomes co-owner of PSA-Hyundai Pusan New Port with PSA, each with 50% equal stakes. With this contract, HMM also secures stable berths for 23,000 TEU mega containerships expected to be delivered in the second quarter of 2020. HMM can also optimize its profitability through reducing cargo handling costs at PHPNT. Furthermore, HMM plans to attract global liners engaged in the shipping alliance to call at Pusan port in order to increase transit cargo volume and terminal revenue. Maritime Fatigue: Just another band aid?